Micaela's mother passed away and the circumstances of her death are suspicious. After receiving a short note from her mother, which was a cry for help that came too late, Mica returns to the place she grew up in, Sleepy Hollow. The town is famous because of the classic by Washington Irving and the stories about his life are still very much on everyone's mind. Her mother was obsessed with the past and Mica doesn't feel welcome in the town. Her mother was strange and the town's inhabitants accused her of the theft of an incredibly precious item. Can Mica find out what her mother was doing and did she actually steal anything? While Mica is trying to find clues about her mother's life project she discovers more about her heritage, about the relationship between her parents and the things her mother was working on. Was she really crazy or did she stumble upon something groundbreaking? Mica needs help with her search and she gets it from two very different guys. They're both looking out for her, but who should she choose and can they both be trusted? Will Mica be able to finish what her mother so bravely started? 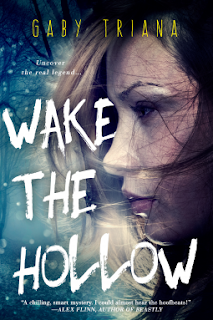 Wake The Hollow is a fantastic gripping book set in Sleepy Hollow. I immediately loved reading about the town's interesting history. 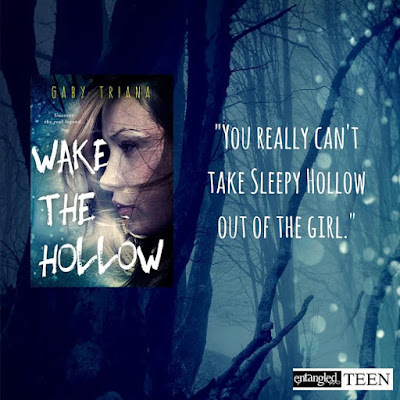 Gaby Triana has clearly done her research and I loved that she's chosen this interesting setting for a spooky mystery. The story fascinated me from beginning to end and I loved the ghosts from the past. Mica gets scare after scare, but she doesn't want to stop looking. She's determined to finish what she started, something I liked a lot. She's naïve and she knows it, but that doesn't mean she can't complete a difficult and complex project. I enjoyed watching her learn to stand up for herself and to trust her own instincts. Gaby Triana has a great way of delivering tension. Wake The Hollow is a vivid adrenaline rush most of the time, but the reader also gets a chance to breathe every now and then. There's a good rhythm which makes the story accessible and easy to read. I loved the mysteries and the secrets and couldn't wait to find out more. I flew through the pages and the suspense kept me glued to my seat. I loved both the creepy scenes and the romance aspect, they go very well together. The ending is surprising and fitting. Wake The Hollow is an amazing action-packed story. Sounds like agripping story. I loved the review but I love the cover even more. It's beautiful. Sounds really intriguing! I like good mysteries and I love that is set in Sleepy Hollow, that makes it even more interesting. My sister is obsessed with the Sleepy Hollow TV show. I'll have to tell her about this book. I found the book quite slow, but the suspense definitely kept me on my toes! I love a good mystery, and I have always loved the Sleepy Hollow tale. I definitely need to read this one! Great review!